T3’s design enforces best practices such as loose coupling by limiting how certain components can communicate with each other. Modules cannot interact directly with other modules but may communicate with them through an event bus. Modules may use services directly, but may only reference behaviors in a declarative way. These restrictions ensure that the various pieces remain loosely-coupled to make dependency management easy and maintenance self-contained. 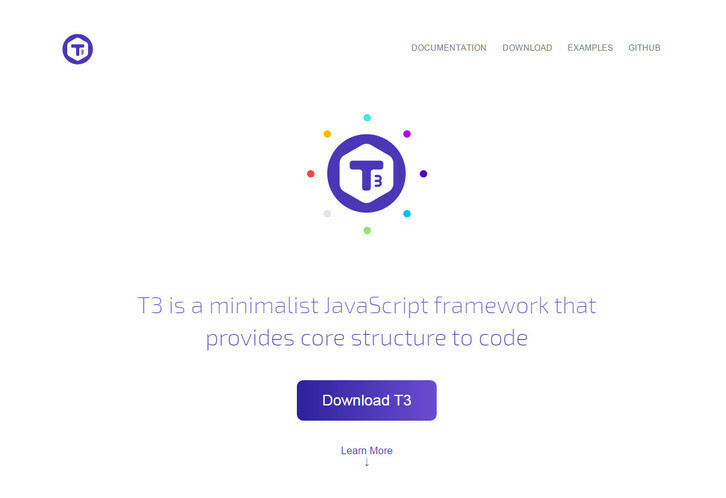 The loosely-coupled nature of T3 components means that creating tests is easy. Dependencies are injected into each component, making it trivial to substitute a mock object in place of real ones. 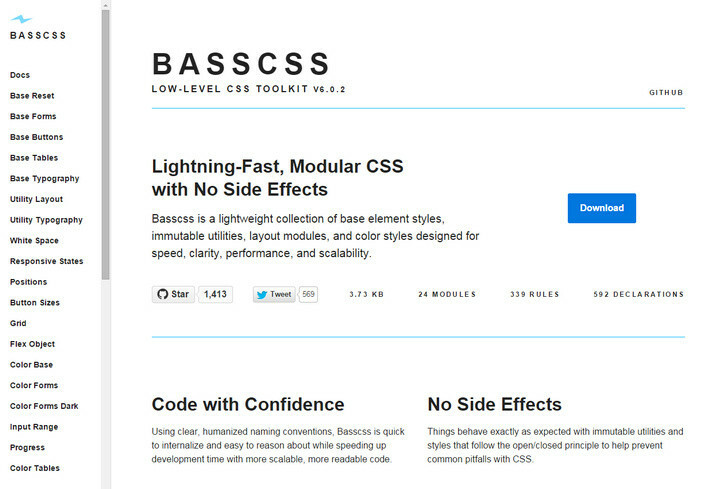 Basscss is a lightweight collection of base element styles, immutable utilities, layout modules, and color styles designed for speed, clarity, performance, and scalability. Using clear, humanized naming conventions, Basscss is quick to internalize and easy to reason about while speeding up development time with more scalable, more readable code. Basscss strikes a balance between consistency and flexibility to allow for rapid prototyping and quick iterative changes when designing in the browser. 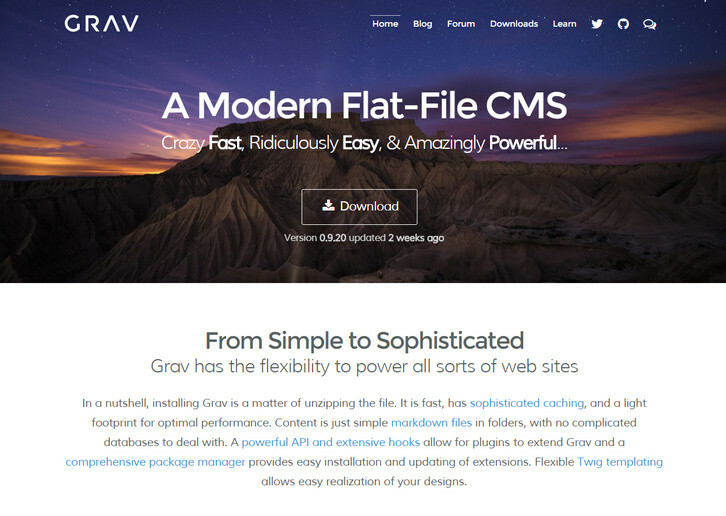 Grav is a Fast, Simple, and Flexible, file-based Web-platform. There is Zero installation required. Just extract the ZIP archive, and you are already up and running. It follows similar principals to other flat-file CMS platforms, but has a different design philosophy than most. Grav comes with a powerful Package Management System to allow for simple installation and upgrading of plugins and themes, as well as simple updating of Grav itself. The underlying architecture of Grav has been designed to use well-established and best-in-class technologies, where applicable, to ensure that Grav is simple to use and easy to extend. 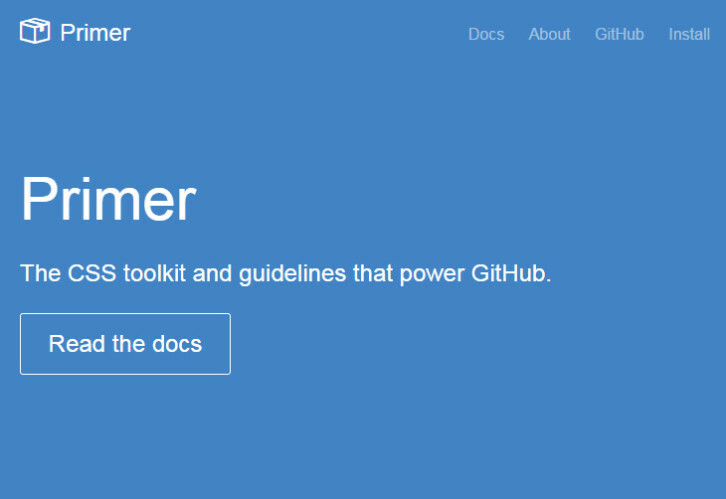 Primer is the CSS toolkit that powers GitHub’s front-end design. It’s purposefully limited to common components to provide our developers with the most flexibility, and to keep GitHub uniquely GitHubby. It’s built with SCSS and available via Bower, so it’s easy to include all or part of it within your own project. 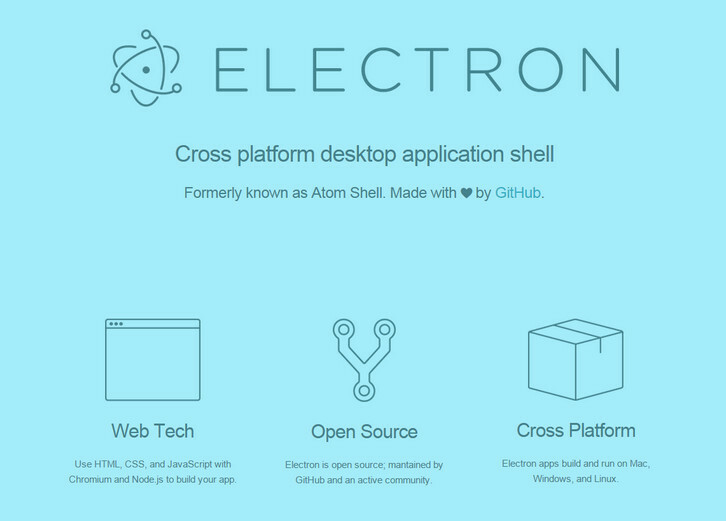 It is available for use under the MIT license and built with open source projects like SCSS, Jekyll, Grunt, and more. It includes a small Gruntfile for compiling SCSS, Autoprefixer for vendor prefixes, and Parker for CSS stats. Dropplets is a minimalist Markdown blogging platform focused on delivering just what you need in a blogging solution. When it comes to basic blogging, all you really want to do is write & publish which is where Dropplets excels. 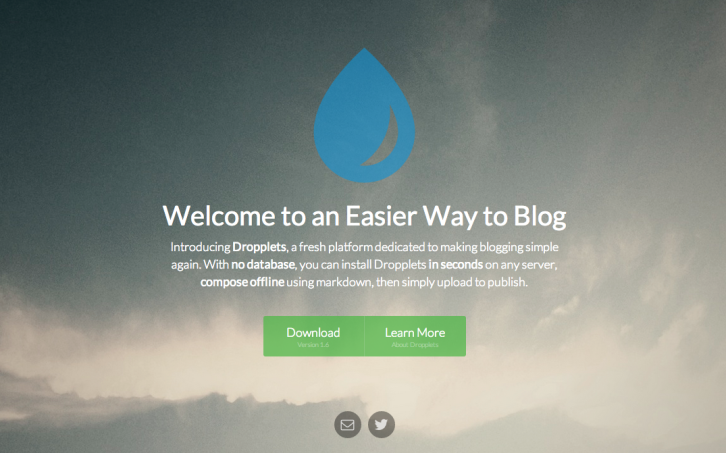 Dropplets is a fresh platform dedicated to making blogging simple. With no database, you can install Dropplets in seconds on any server, compose offline using markdown, then simply upload to publish. You can install it on any server in just about 30 seconds. 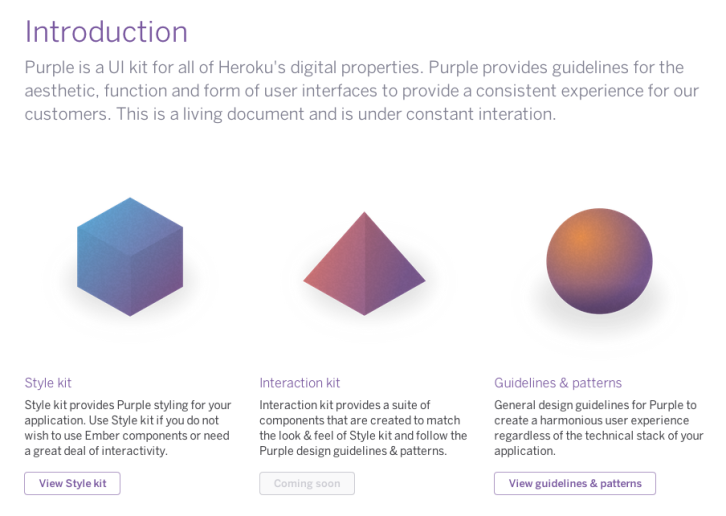 Purple is a UI kit for all of Heroku’s digital properties. Purple provides guidelines for the aesthetic, function and form of user interfaces to provide a consistent experience for our customers. This is a living document and is under constant interation. They are not releasing a Bootstrap clone, they are simply creating documentation for their own design standards. 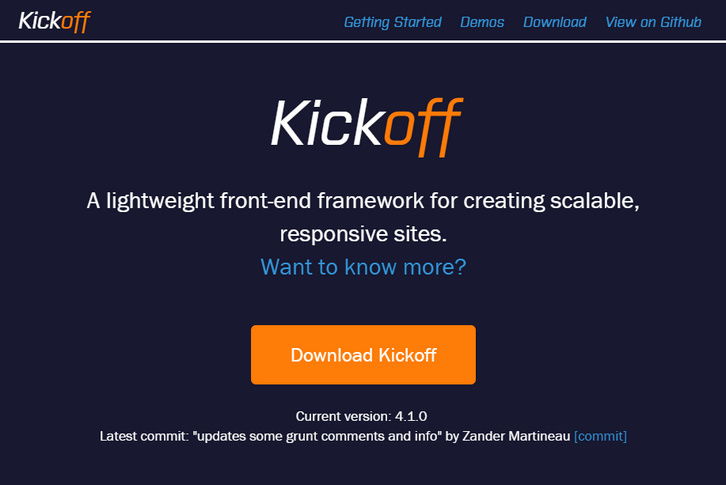 Kickoff is a lightweight front-end framework for creating scalable, responsive sites. 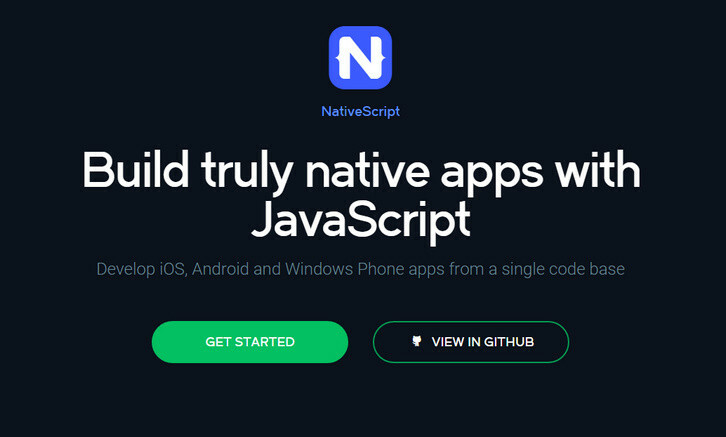 As front-end developers, the type of project we work on is becoming more and more diverse. Kickoff aims to help keep a consistent structure and style across all of your projects, without adding the bloat that other frameworks can lead to. Do you need to query large JSON structures? Do you end up coding loops to parse the JSON and identify the data that matches your query? DefiantJS offers a better way. DefiantJS provides the ability for you to build smart templates applicable on JSON structures, based upon proven & standardized technologies such as XSLT and XPath. 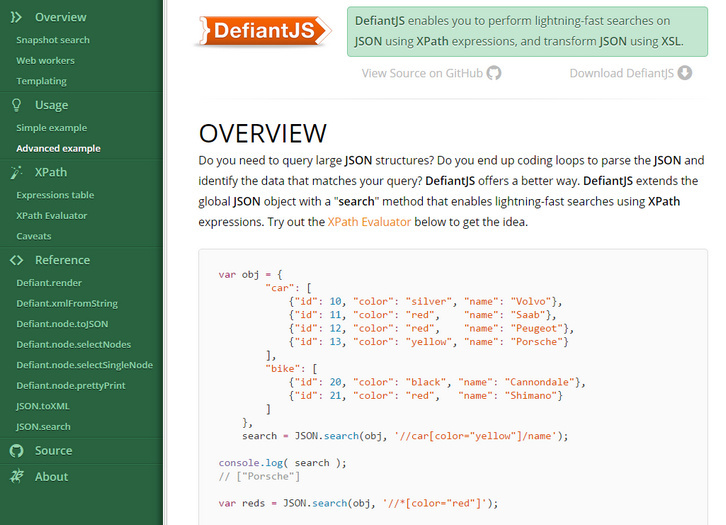 DefiantJS also extends the global object JSON with the method “search”, which enables searches on JSON structures with XPath expressions and returns matches as an array-like object.